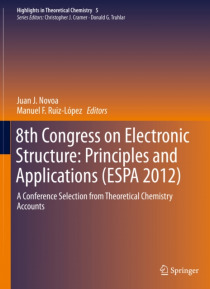 This volume collects research findings presented at the 8th Edition of the Electronic Structure: Principles and Applications (ESPA-2012) International Conference, held in Barcelona, Spain on June 26-29, 2012. The contributions cover research work on methods and fundamentals of theoretical chemistry, chemical reactivity, bimolecular modeling, and materials science. Originally published in the journ… al Theoretical Chemistry Accounts, these outstanding papers are now available in a hardcover print format, as well as a special electronic edition. This volume provides valuable content for all researchers in theoretical chemistry, and will especially benefit those research groups and libraries with limited access to the journal.